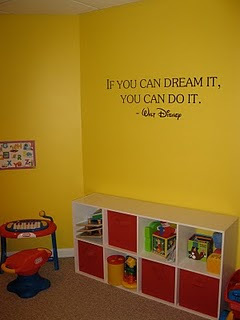 Isn't this the perfect quote for this bright playroom? I think it looks fantastic on that yellow wall. And she's hosting a giveaway for a wall quote of your choice (really, if you win you get to pick anything you want - cool, eh?). Go. Quick. Enter. Win. Good Luck!